Earlier this year, Arnold Ligtvoet of RaptoBike posted a tantalising photograph on BROL. It looked to all intents and purposes like a stock Raptobike Lowracer which had been fitted with the Midracer fork to accommodate a full-size front wheel… and it was! A few days later the fork arrived, and I was able to fit a spare 700C drive wheel to my Raptobike with only a few minutes’ effort. What a difference! With a 300km PBP qualifier just around the corner, this was no good at all – however I was able to fit the 559 drive wheel from my hardtail without overlap, and it was in this configuration that I posted one of my fastest ever brevet times – a moving average of 16.9mph over 185 miles on the legendary Mull It Over (which with ~9000 feet of ascent is not flat, although it’s far from mountainous). 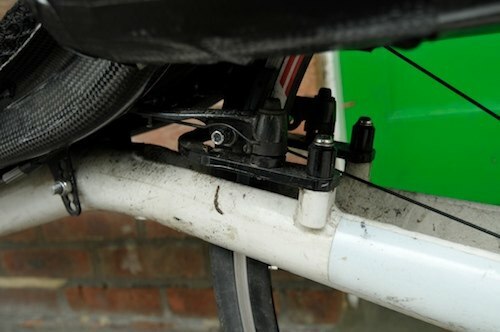 One word of warning: you can’t use an ordinary dual-caliper brake with the midracer fork as the ‘arm’ fouls the main tube! A disc wheel slots in and out no bother, but if you want to use the rims you need to find the unusual Tektro R725 time trial brake (fortunately sold by Arnold on the Raptobike webshop). This feature is common to the Raptobike midracer too. The addition of a big front wheel raises my seat to ~40cm (up 15cm) but this measure is slightly deceptive as it has very little effect on the seat back (the seat just gets more reclined, which is how I like it). In the end I have lifted the seat one notch at the back but I can still happily balance on one hand with 2x700C wheels, as I have become accustomed with a 406 up front. Note that the stock bike is a 406×559 where mine is a 559×700, so it is a little higher across the back end too (I could have put a 700C wheel on the stock bike, but then it wouldn’t have been stock). If you do not like a reclined seat, obviously it is dubious to fit a much larger front wheel and cant the whole bike backwards. Certainly a seat can be redrilled to mount a little higher up and so you can perhaps get ~25 degree seating with a big front wheel. Mine is closer to 15 degrees as far as can be judged. Another important point is that this modification is not handling-neutral. Lifting the front of the frame shallows the angle of the (integrated) headtube and increases the trail of the front wheel. This makes the steering noticeably sharper and more ‘hands on’. I commented at the time that while I can’t ride the stock lowracer no-handed anyway, I *definitely* can’t ride the big-wheel conversion no handed! Whether you get on with the handling or not is probably a personal thing. I found that I soon adapted to the revised steering behaviour and have since completed two 300km, a 400km and a 600km brevet comfortably, as well as rush-hour commuting through central Edinburgh. I can ride just fine one handed and I can look over my shoulder without wild swerving. Why might you want a big-wheel lowracer? Second, you can take advantage of more commonly available 559 or 700c spares – tyres plus inners. (In fact, it’s even better than that because you can easily share an inner tube in a pinch between the two sizes). When you’re in the middle of nowhere in the middle of the night, this is a bigger consideration than it might be for casual riders! Third – you can either have superior aerodynamics (if you recline the seat towards zero degrees) or improved clearance around the rear wheel (if you raise the seat to keep the same angle). Previously to get the seat angle I wanted I ran the risk of rubbing the tyre against the seat back – now there’s plenty of room. For a long fast effort, you can drop right behind your knees. Here you can really see the difference in seat height and recline. 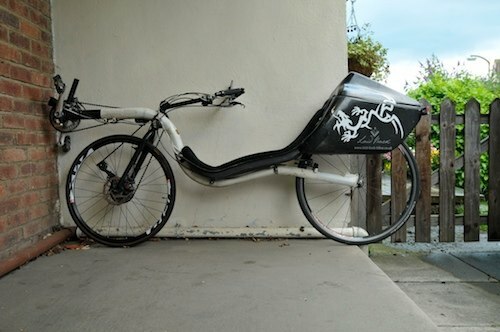 The converted lowracer is a one-mission sort of bike, for people who want this sort of thing – while the midracer will benefit from ordinary bike handling and a wide variety of setups “out of the box”. Very interesting! Especially since I have been considering getting a highracer in addition to my raptobike. Have you considered putting a 700cc front wheel on it? Would it be possible to do that if I use a CX fork with discbrakes instead of the midracer one ? The setup with the Planet X carbon wheels is dual 700C… you can’t use a different fork because it needs to have rear hub spacing and a derailleur hanger, I’m afraid! Hi Dave, nice review of your conversion. I ride mine with a 650c on the front and a 700c on the back. Works well and is fast indeed. Your rims look very nice on the bike. Good luck with the Pbp! Dave, that’s one hell of a bike with those sweet carbon wheels! Such a racy look to it with that laid back seat and all. 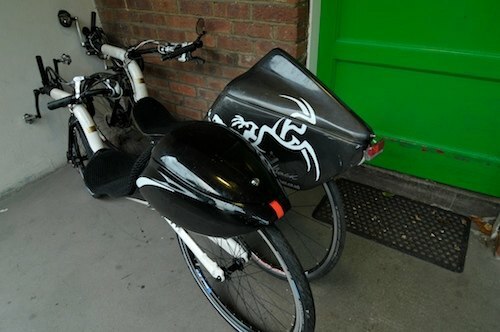 The tailbag you’re using doesnt look like the one from raptobike – what model is it? Bit worried about ordering one that won’t fit.. I saw Arnold’s Big Wheel Lowracer earlier this week, neat and fast looking bike ! I would consider switching to dual 700C wheels myself, but I’m afraid the seat will be too reclined for me. I’m riding my Lowracer in the second highest position, in lower positions my shoulders and necks tart to hurt after a couple of hours. I’m afraid the Lowracer 700C conversion is not for me (I know there’s the Midracer, but still …. ). But it” still a nice bike to look at 😉 ! Succes with the PBP ! It’s very nice and light at < 1kg, compared with other boxes – and large enough to hold everything I need (and lots of junk I should have left at home). The only problem is when you fall from the bike, the box gets slammed into the ground and the CF at the front (below the dragon’s mouth on either side) is quite badly cracked after a couple of hard years. The small tail box on the stock low racer looks also nice. What brand is it? I don’t know – it seemed to me like a Novosport one but I can’t be sure. Thanks Dave for Your inspiration! I made the conversion to 559 in front and 700 in the back. I had to change my 172 mm cranks to 165 mm, but I will not go back to a small wheels again. Have mad ca 100 km so far and are feeling more and more confident with the handling of the bike. I tried sticking a 20″ wheel on the back of my raptobike to see if I could get along with the shallower head tube angle and higher cranks it was a non issue (although the bike looked a bit odd). So, big wheel lowracer is definitely my next project! Probably going to do dual 26 with kojaks at first and then when summer rolls around invest in a pair of good-ish road wheels and super nice looking adjustable paul moto bmx brakes. I wonder if I will need shorter cranks. how far is the boom on your bike extended? 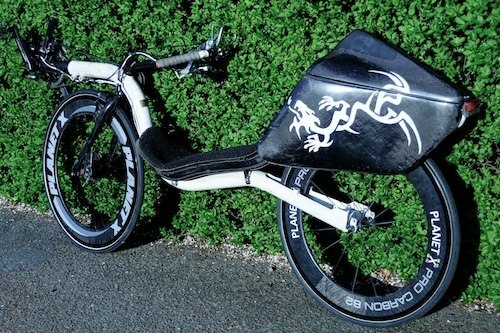 Alex – my xseam is 43″ but the seat on my raptobike is mounted quite far forwards. Nevertheless I only required short cranks to use a 700C wheel – for 26″ there was just clearance with the 175mm stock chainset. Thanks for a great write up. I have a home-built FWD low racer and was inspired by your report to try it out with a 26″ fork. The result – I found the handling worryingly weird, way too twitchy to go hands off, and yet a feeling of steering in treacle! Clearly my change of head angle/trail did not go down well! But not to give up, I’ve knocked up a new frame which keeps the original geometry using the larger fork. First impressions around the car park – it now seems to handle really well, and I can go hands off no problem. I also agree that the larger wheel seems to roll more smoothly. I have more work to do before I can try it out for a real road test. Now that you’ve had nearly a year of experience with your 700 Rapto, how would you sum up your feelings compared to the Low Racer? If you could choose between the two for an Audax, which way would you go? I think having two large wheels is the way to go, both from the perspective of rolling resistance and also sharing spares, nice (aero) wheels and tyres etc. However, I didn’t stick with the 700C Rapto, it’s currently up for sale via Laid-Back-Bikes and I’m hoping to transition to one of the new Euro-style “high” racers (something with a seat height of 20″ or a little over, as opposed to 26″+ of the US stick bikes). I’ve read your review several times. Many times, in fact, as you are the only person “in the world” who has actually gone into detail about Rapto conversions. Finally, I’ve gone and got the parts and a bit of labour (one or two other things needed doing and it’s good to support bike mechanics) and done the deed: my bike is now 700+559 with standard gearing. I’ll report on how it feels after a little commuting on London’s roads and out in the lumpier parts of Essex. 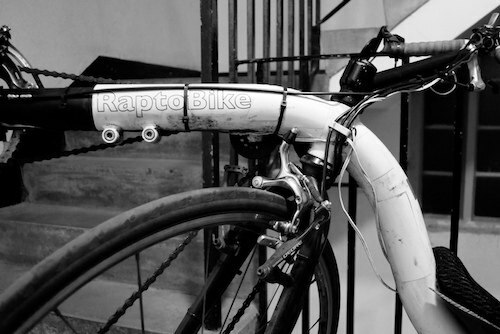 Stuart Dennison of Bikefix suggested that changing the wheels would make the Rapto “a different kind of animal” and reported that he never thought Arnold had it in him to be a speed freak until he met his dual 700 Rapto! The only worry that remains is those hills: how will I fare with being more “upside down” than before and with steep hills, which I’ve struggled to cope with given the Rapto’s weight (and my lack of fitness?). My companions (Stuart and an infuriatingly fit chap called Dave) go up hills on their light Challenges like rats up drainpipes… I wait to see how I do now! Glad to hear this page has helped you out. There are a few conversions like this out there now – do let us know how you get on! 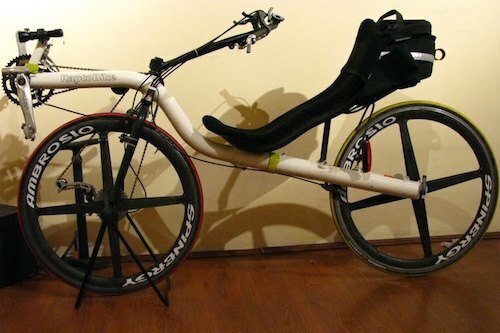 I’m really interested in getting a RaptoBike and your site has pretty much made up my mind, but I wanted to ask now that you have reviewed the Midracer, if you could have only one recumbent would you choose the Midracer or the modified 700c Lowracer? I’m just curious as I have build a few bents in the past and i’m now looking to buy one, I want something that is fast and only for summer dry weather use. But because I live in London I have to escape it and ride in traffic to get out where I want to be. If I were you I would look closely at the midracer in this scenario. With 700c wheels you can have your pick of racing gear and you can lay it back for great aerodynamics, but the extra height may give you extra confidence to work your way through London town. Although there’s no shortage of evidence that low bikes win out in raw aerodynamic terms, there’s more to it than meets the eye, and other factors (such as having the big wheels to roll over rough surfaces) may win out for most riders. For what it’s worth I’m very keen on the High Baron right now. I was supposed to unveil it after a brevet this weekend but last minute technical issues meant that I’m postponing that until the Tour of the Borders sportive next weekend. That highbaron is absolutely amazing, it’s just what I was looking for. I never though I could afford a bike like that and that’s why I was so interested in the Raptobike, the very long waiting time for a Rapto put me off as I wanted it to ride this summer. I will be eagerly awaiting the unveiling of the HighBaron and seeing what you think as I’m so close to ordering a frame kit. 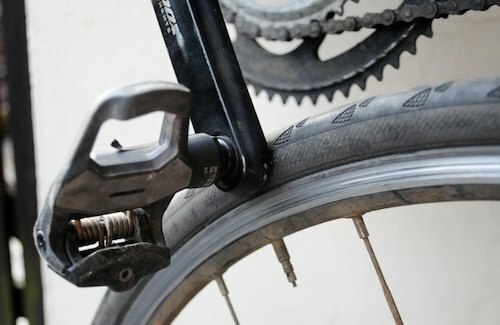 Would that work with a monoblade such as http://www.bikefix.co.uk/blade? then presumably you could fit any size tyre width and disc brakes?